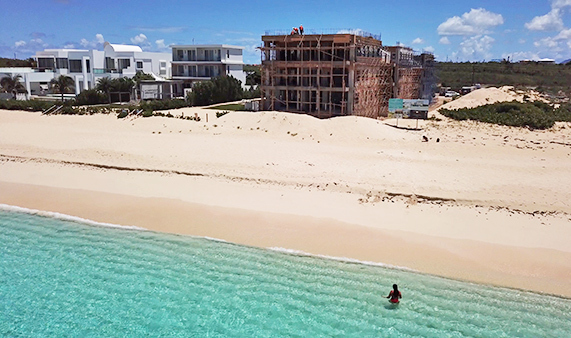 Tranquility Beach is the latest residential development by internationally recognized Property Developer and Architectural Designer, Ian "Sugar George" Edwards and a man with over 30 years in finance and real estate, Neil Freeman of Aries Capital. 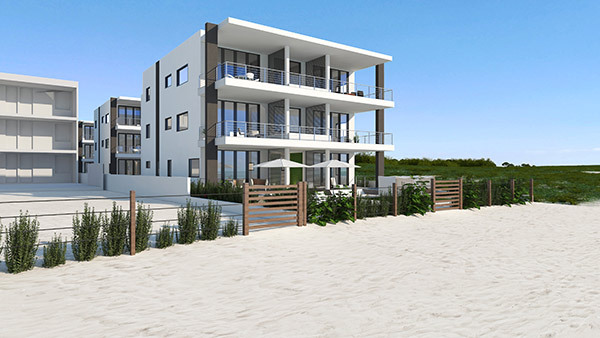 The development's first phase, Signature Suites, includes 15 luxury residences set in three modern beach villas. 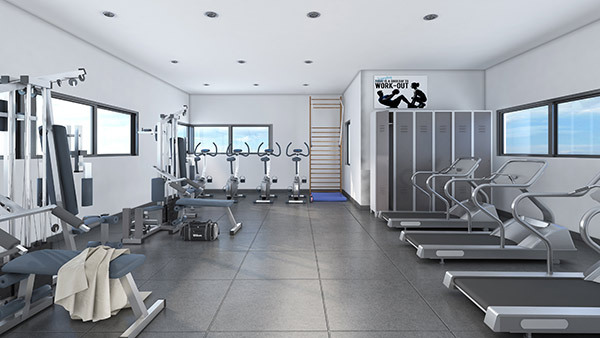 Residences come complete with all of the amenities of an upscale boutique resort. The residences are available for sale and the property will open December 2019. 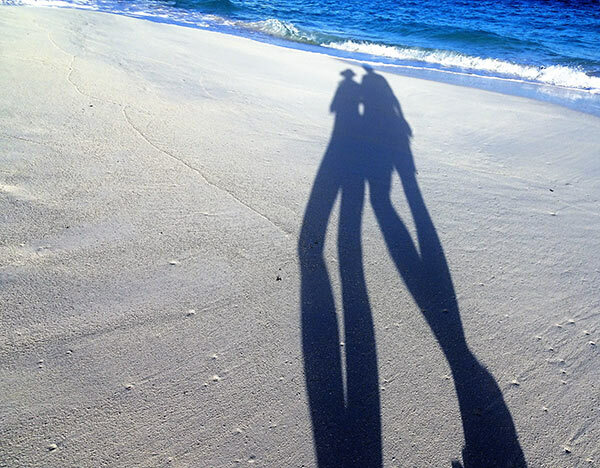 A project of passion, let's step foot on Tranquility Beach. 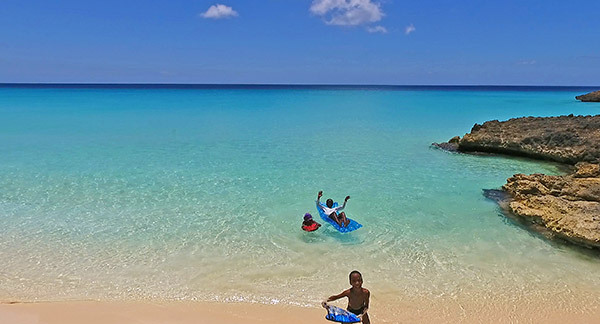 Anguilla's north shore beauty known as Meads is a Caribbean "best." 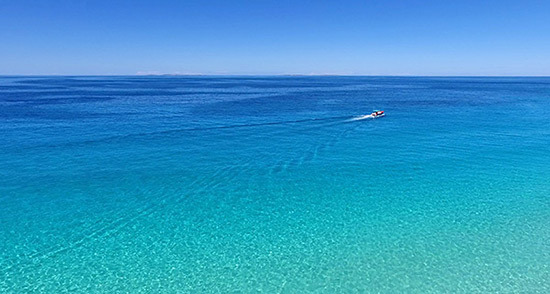 It is one of the few beaches world-wide whose white sand sea-floor (no reef) stretches for miles in an infinite gradient of blue. "Magic" is the word often used to describe the feeling that overwhelms you as you watch the warm Anguillian sun illuminate the bay's waves. One dip inside, and Meads makes you a believer. An undeniable magic lies within these pure azure waters. 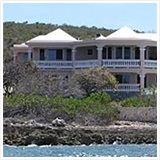 For years, this beauty has captured the imagination of Anguilla Architectural Designer, Ian "Sugar George" Edwards. His latest development is a culmination of decades of experience, knowledge, expertise and a deep appreciation for Meads. 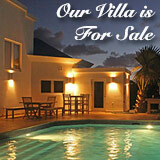 Tranquility Beach is one of the last pieces of Anguilla real estate of its kind. It is one of Anguilla's best. Set in the middle of Meads Bay's expansive curve, Tranquility Beach's unobstructable views are vast. 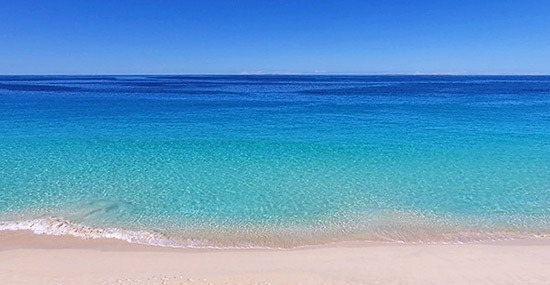 Here, Meads' entire crystal-clear bay stretches before your eyes. The location is tucked away from the beach's bigger hotels and chaise-lined strips of sand. Only the surf's gentle lapping surrounds you. Tranquility Beach is true to its name. It is undeniably peaceful. When you want a bit of action? You are in good company. 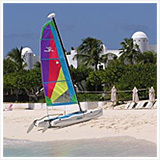 Four Seasons Anguilla and Malliouhana, an Auberge Resort, book-end the beach. Some of Anguilla's best restaurants, including the famous Blanchards, Straw Hat and Jacala (a favorite of Martha Stewart and Roman Abramovich), line its shores. One of the island's top grocery stores is a one minute drive from your residence. "Tranquility Beach has been eight years in the making," Sugar George explained as he and I walked its expanse of raw land that spans the beach (see red markers on Google Map below for exact location). A sophisticated man with a passion for his craft, Ian "Sugar George" Edwards (better known as simply "Sugar George") has a proven track record for architecture, design and property development. With Ian Edwards AKA "Sugar George"
An architectural masterpiece, International Property Awards bestowed the prestigious acclaim of "Best Single Residence Architecture" on Sugar George for this immaculately designed villa. It attracts the most discerning clients and celebrities who enjoy quality family time in this magnificent space. One door down from The Beach House lies Sugar George's next project. 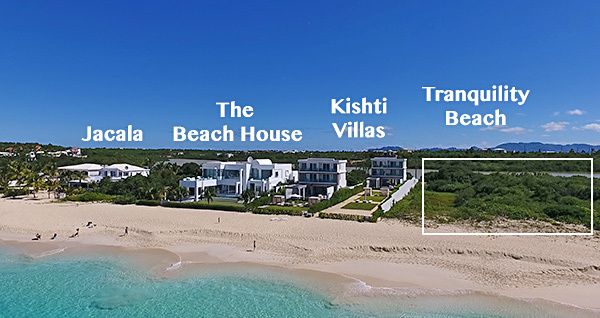 Tranquility Beach promises to be his greatest development yet together with long-term Anguilla lover and homeowner (Villa Alegria), Neil Freeman of Chicago's Aries Capital. Tranquility Beach's first phase, Signature Suites, begins three doors down from five-star restaurant, Jacala and two doors down from the acclaimed villa, The Beach House. 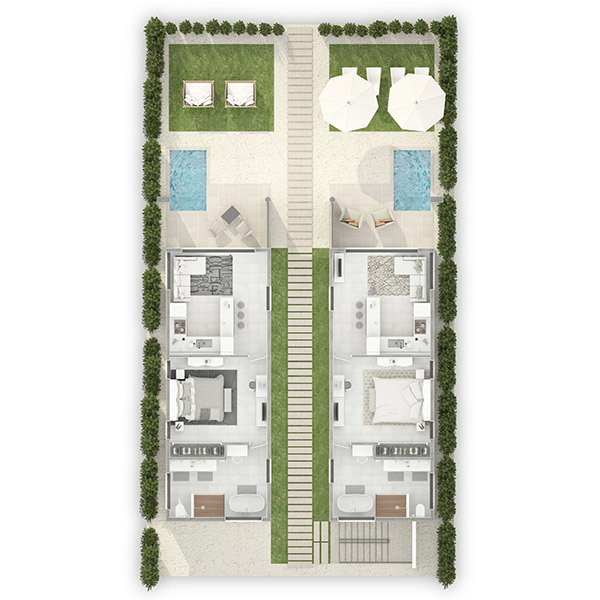 Phase one brings a total of 15 residences in 3 sharp luxury villas to Meads Bay. Each villa has 3 floors (Ground Floor, Floor One and Floor Two). The Ground Floor and Floor One each house 2 residences. They are well-separated by a spacious hallway. Floor Two houses 1 penthouse residence. It sits in front of "Villa B," "Villa B" in front of "Villa C."
Residences are available as three bedroom penthouse units or one bedroom units (with the option to merge two one bedroom units into a two bedroom unit on the First Floor). 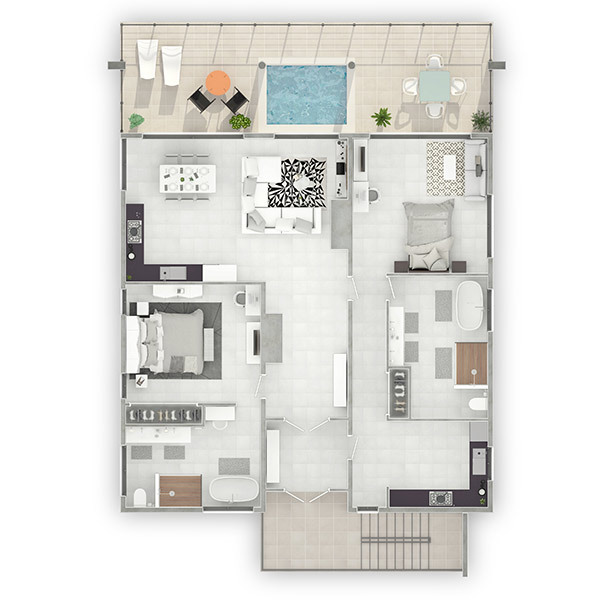 The three bedroom penthouse residences boast 1,793 square feet of interior space (2,322 total square footage). Each bedroom comes complete with an en-suite bathroom. The master bedroom and kitchen, dining, living area open onto the residence's private terrace. 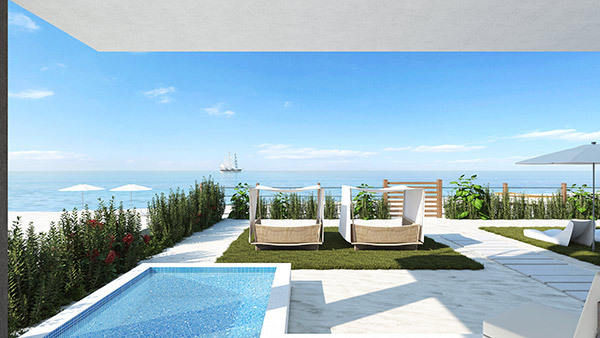 All penthouse residences are equipped with two private plunge pools. There is also the option of a rooftop terrace. Ground Floor Patio of "Villa A"
All one bedroom units have private patios and plunge pools. Exterior living space runs from 160-200 square feet. 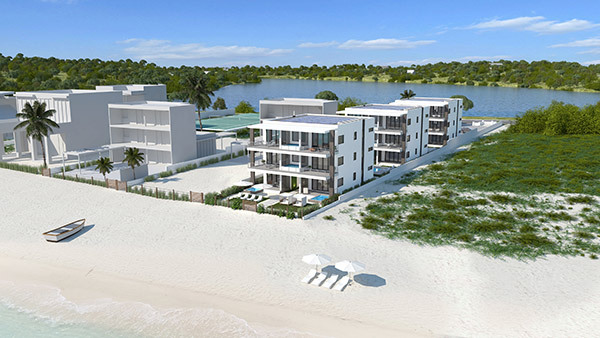 The rendering below shows "Villa A's" two one bedroom residences side-by-side. 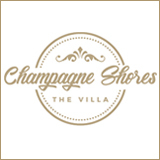 The one bedroom residences in Villas "B" and "C" layout similarly to those of "Villa A." There is flexibility if you wish to purchase an entire floor. You can merge two one bedroom units on the First Floor, making a two bedroom unit of 1,720 square feet. 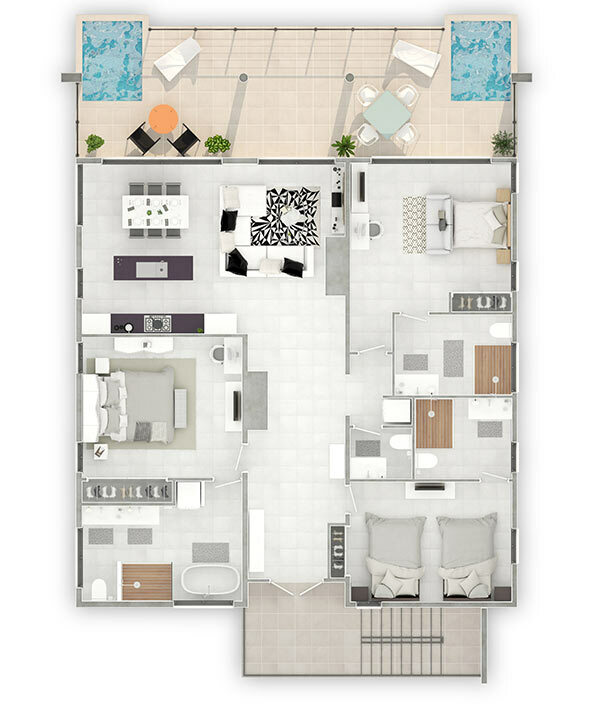 See rendering below for a sample two bedroom unit. Outside, your private balcony (with plunge pool) gazes out to Meads Bay. Residences are complete with state of the art furnishings. 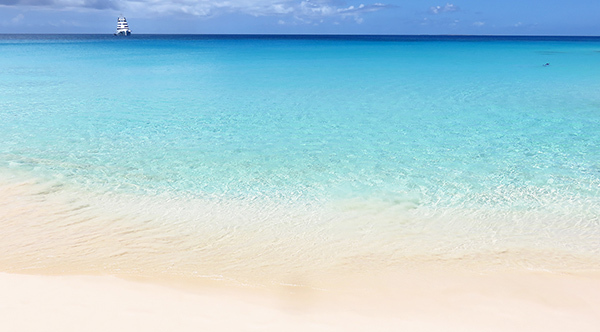 There is something to Anguilla's blue hues, the genuine warmth of its people and the laidback vibe that makes you feel truly free. 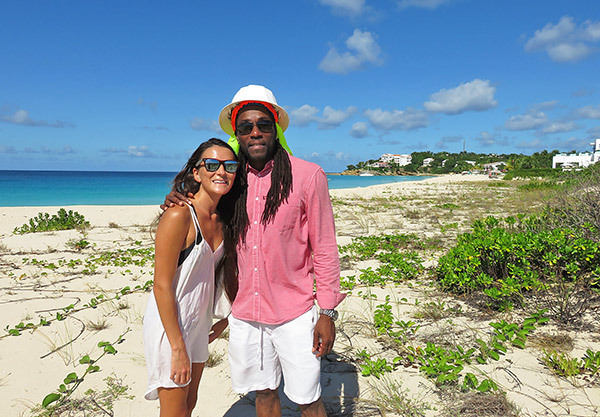 If you have been to Anguilla, you know that from visit #1, you are hooked. 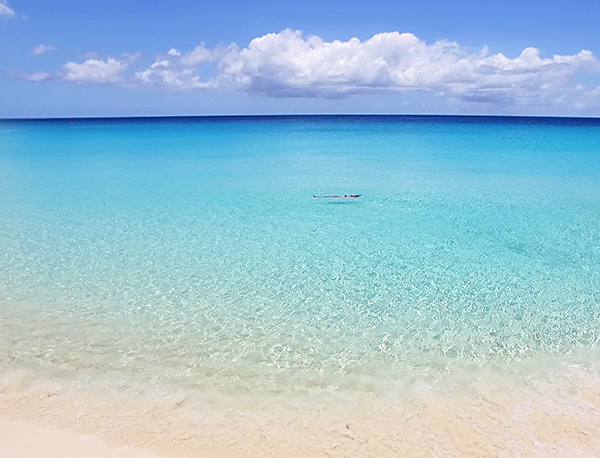 "There is, alas, a difference between “vacationing” and “living” somewhere: “living”—at least in Anguilla—is as good as it gets. When you are “vacationing,” you must dole-out your most precious commodity….time. “Where are we going for lunch, where are we going for dinner….do we have time to snorkel before that”? 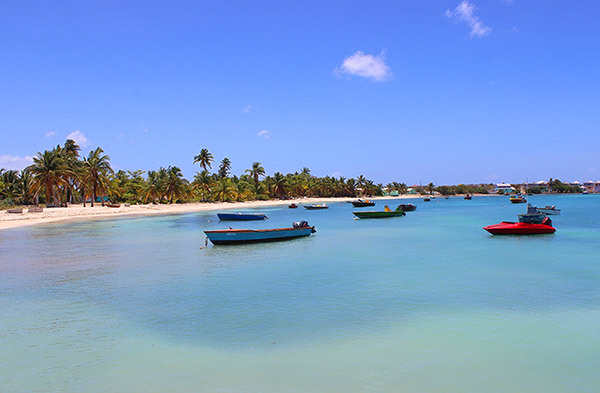 “Home” is joining a civic organization or a church, volunteering at a school or with a youth sports team….participating, knowledgeably, in a political discussion or just “liming,” watching the sun go down over Island Harbour as the fishing boats return with their abundant catches. I thought that I knew Anguilla well, but when we starting “living” here, I realized that—as much as I thought I loved Anguilla—I discovered it anew and loved it all the more." 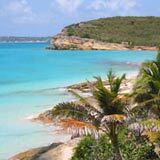 Melinda Goddard shares that love for Anguilla and her journey in her brand new book One Way Ticket. 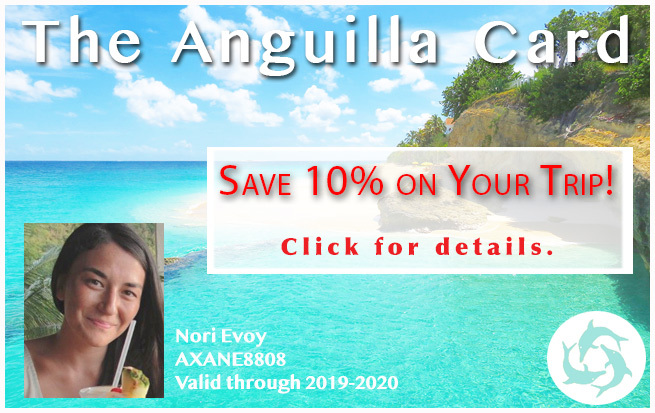 "Anguilla seems to be the only place on earth where you can sincerely live the mantra that "friends become our chosen family" every day. It is an egalitarian society of confident, engaged, and sophisticated people, no matter one's work or formal education (though most everyone is well traveled and holds a degree). Truth still matters here, and mutual respect is fundamental - along with courteous greetings and acknowledgement of one another, even if not yet acquainted. 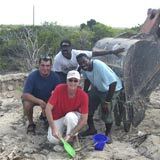 I hope you will hear these strong, welcoming voices when reading "One Way Ticket: From America to Anguilla" about the winding path we took to building our villa and a new life. Indeed, there is something very special about this place. Yes, it is beautiful, has sensuous beaches, spas, and endless culinary delights, but the people of Anguilla have made it our home." That feeling of "home" is felt through and through, also echoed by home owner Loren Pearson. "We are so thankful for the special "family" ties we have developed here. This is a caring, friendly island. It didn't take us long to decide we wanted a home here. 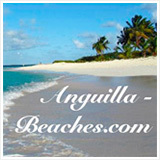 As life long "beach people", Anguilla beaches are the best in the world. The island is clean and safe but perhaps the strongest tie is the opportunity to interact within a thriving, passionate, active community. Besides being welcome at the many community activities and events, there is the open invitation to share our time, talents and knowledge. 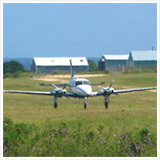 For these few reasons and many more, when we are home on Anguilla we feel "here is the perfect place to be"." Anguilla is a most special place to call home. Tranquility Beach makes that "move" a breeze. 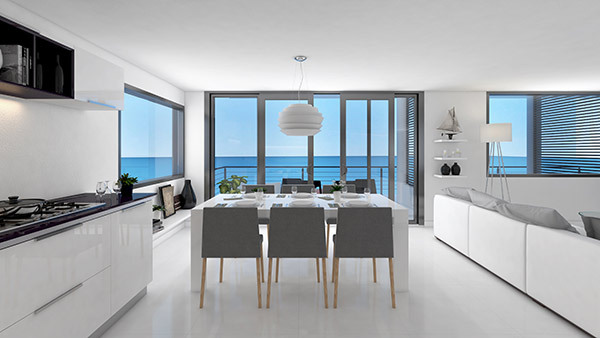 In addition to its chic and modern design, Tranquility Beach's property management takes care of all maintenance. And, the boutique property's residences are part of a rental pool, which are professionally managed and marketed for you. We recently stepped inside the luxury development with award-winning architect, Ian "Sugar George" Edwards. For a look at the project's current status, see the video below. 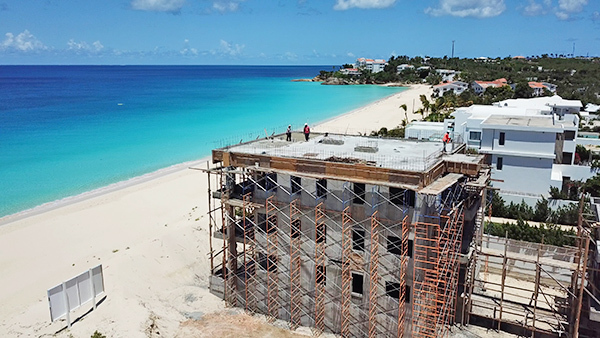 Construction is well underway at Tranquility Beach on Meads Bay. 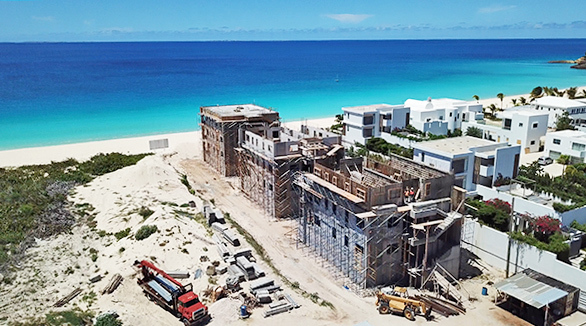 Tranquility Beach's first phase, Signature Suites broke ground in December 2017 and has made steady, strong progress ever since. 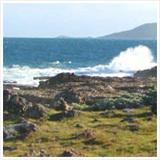 The developer, Sunset Homes has extensive experience in the region. It shows. The development is on track to open Dec. 2019. There are a total of 15 units available for purchase across Villas A, B and C.
Rooftop Terrace View From Villa "A"
All suites are sold turnkey. Each suite is fully furnished, complete with a full kitchen. They also each boast a private terrace with private plunge pool facing Meads Bay. The penthouse features an optional additional terrace, a rooftop terrace. 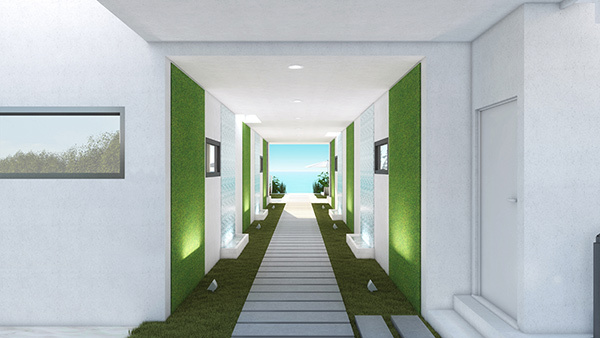 Tranquility Beach is designed by award-winning architectural designer, Sugar George. Sugar George has designed some of the Caribbean's most luxurious and exclusive properties. One of his most well-known is The Beach House, which won International Property Awards' most prestigious award, "Best Single Residence Architecture." Here at Tranquility Beach, Sugar George's classic and coveted clean line design rules supreme. 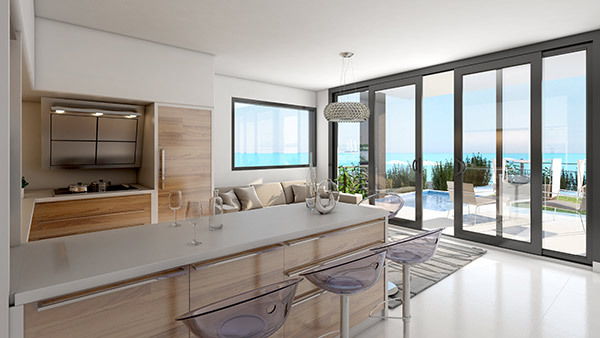 With luxurious finishings, Signature Suites' design emphasizes Meads Bay's natural beauty. In addition to being sold turn-key, everything is taken care of for you. Electricity, water, WiFi and maintenance are all handled. 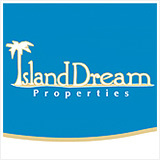 All units are placed into a rental pool and are professionally managed. 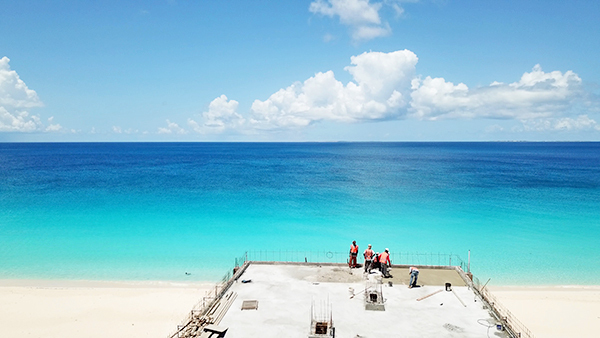 Tranquility Beach's first phase, Signature Suites will open Dec. 2019. 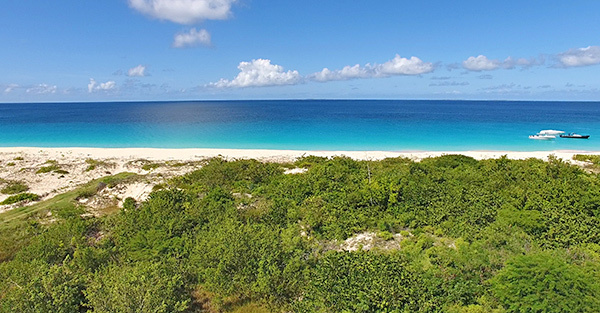 Tranquility Beach is a rare opportunity to own on a beach as grand as Meads Bay.